Thickness Gauge, DM 100 This thickness gauge is the classic in this program. For many years, this model is proving itself in laboratories around the world. Thickness Gauge, DM 2000 The Thickness Gauge DM 2000 offers the same specifications as the DM 2005, however the foot lowering is hand operated. Thickness Gauge, DM 2005 Alternative for the Thickness Gauge, model 2010. Equipped with a dial gauge with seven-segment display and individual keys, and a foot switch. Thickness Gauge, DM 2010 Thickness Gauge in accordance to standards. 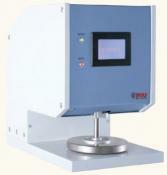 Measuring ranges, 0–10 mm, 0–25 mm or 0–50 mm. Or the equivalent in inches,(switchable). 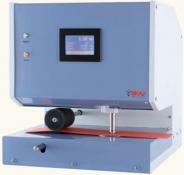 Thickness Gauge, DM 2020 This thickness gauge, combines all features of the DM 2010 with automatic material feed.